Headlines: The fishing has been getting better and better over last week with regular reports of good fishing. Water temps in the lakes have dropped significantly and the fish really are on the chew. *Mike Shanahan sent this photo in of a nice river brown. I got this this one on a nice little deerhair hopper which I put together. Took it right in the middle of the day too. I rekon hoppers are all you need from November to April. I love them because fish like this will attack them, even twice as the case was here, I got on to this fellow before on the exact same fly! Lake Eucumbene:- The lake has had some good mudeye hatches over the past week and there are plenty of fish on the move on both mudye patterns and nymphs. The bottom end of the lake is still the best bet with Seven Gates and Buckenderra areas producing somegood fishing.Mudeyes have been hatching in numbers and the fish are starting to feed on them. The Rainbows in the lake still in excellent condition and are fighting hard. *Dave Maurier from Cooma had a good evening session this week hooking eight and landing five on olive and green nymphs. 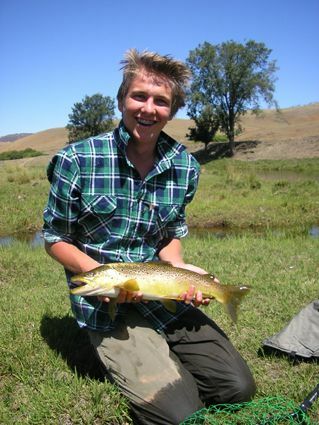 Biggest was a rainbow of1.5kg and was caught near Buckenderra. *Richard Mould had a tough session where he had plenty of hits but could not get connected. He soldiered on and in the end managed to land a very respectable 2.5kg plus brown. *Alan Hocking and Colin P had a good time on the lake out from Buckenderra recently with some very well condtioned rainbows taken on both flat line and leadcore. They ended up keeping fourteen between them over a couple of days and released just as many again. Tassies in colours # 67, #51 and #65 were the pick with the # 65 performing best on the flat line. 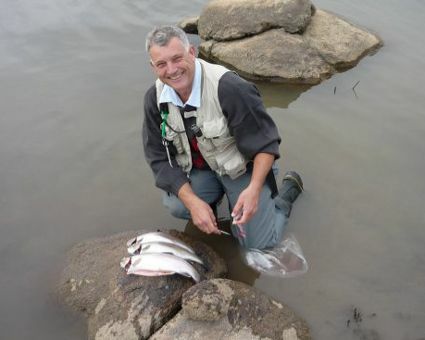 Jindabyne:- Jindabyne trolling reports have been scarce but there have been few fish at the kalkite/waste point end of the lake. Fished at seven gates through Thursday night and morning catching 5 good size rainbows on mudeyes under a float. Fish seemed to come on from around 8 till 11.30pm then back again around 7.30am. Headed to the Eucumbene river through Friday for two 'almost takes' from browns not converted due to lack of experience fly fishing skills. I might have to chase up some on stream lessons from a guide down there soon. Any way many thanks for your help, the quick trip down was great. Wayne Flynn (Flynns Wrecking Yard) & I had a relaxing afternoon session out at Rushy Plains on Saturday night. We picked up some mudeyes & powerbait from your store on the way out from Cooma and got to the lakes edge around 5:30 pm. By the time Id greased my line and got the first of the mudeyes under a bubble float and let it start drifting, it was around 6:00 pm. Flynny was still fiddling with his powerbait setup when the first of the fish came onto the mudeye - the grin & the picture says it all. So it was one nice rainbow to me on a mudeye, one stubby up in the first fish, biggest fish and most fish stakes and zip to Flynny on the powerbait. Flynny put out his powerbait on a bottom rig and started working on his bubble float set up as well. This fishs twin then decided it was time to join his brother in swallowing a mudeye, so it was well on the way to two stubbies up in fish lotto. The third rainbow was on the bank before 7:00 pm, again to a well drifted mudeye, making it mudeyes 3, powerbait zip. All had been feeding on a mix of mudeyes, nymphs & snails. By this stage, Flynny was pretty disappointed, so I got my fly rod out and started working the banks with some nymph/streamer/mudeye patterns leaving the poor bloke to tend the rods and drown his sorrows. Needless to say, the mudeye under my bubble floated rig went off again while I was waist deep in water, but Flynny managed to pull the hook before setting it. Apart from one touch I got on a Craigs Night Time and a few rising fish, that was all the action we saw on the lake through to 9:30 pm when the Alpine Hotel beckoned, leaving me (and the mudeyes) 3  0 up on Flynny & the powerbait. 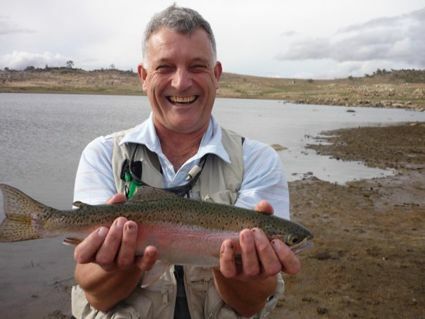 Can you guys do a favour - help out a Cooma local and offer Wayne some fishing lessons over the next fortnight so that the next time I swing through and pick up my old mate for a spot of fishing, hes saved from the role of just being the photographer and beer provider.